Loopholes in our Kitchen Utensils, to enjoy the accesibility and decoration. SHOP SMART, SAVE AND GAIN: Don't waste your time in spending a fortune with buying each utensil individually, buy yourself a full 24 piece high-quality light-weight set for cheap and gain a rich selection of professional stainless steel cooking utensils, which will enhance your cooking experience. It is especially designed to help you with all your food preparations, such as whisking, peeling, cutting, stirring, mixing, basting, baking, grilling, frying and serving! ONE YEAR WARRANTY MONEY BACK: Stop shop with Kaluns Kitchen utensils! Our promise to you! 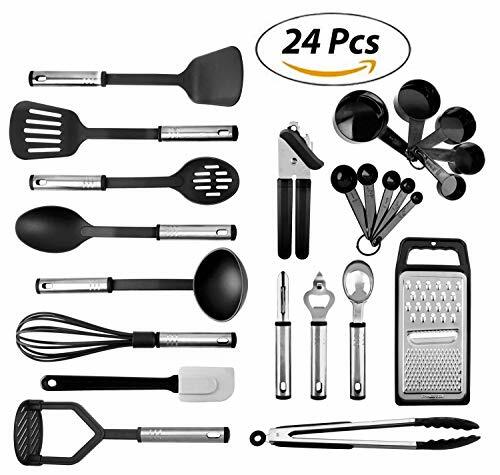 If you are not 100% satisfied with our 24-Piece Kitchen Utensil Set, you are insured for a "Full one year MONEY BACK GUARANTEE", without any questions asked! This makes your purchase absolutely risk-free and you can enjoy testing out its quality and durability! With choosing Kaluns Kitchen utensils set, you have made the right choice! If you have any questions about this product by kaluns, contact us by completing and submitting the form below. If you are looking for a specif part number, please include it with your message.